Mother's Day is a big day in Germany the same way as it is celebrated in the USA. Do you want to surprise your mom, sister, grandmother, or aunt with something special? What about a home made cake baked by you? We found a wonderful recipe for you. 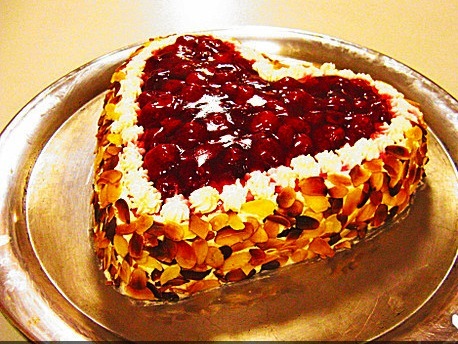 The German Raspberry Heart Shaped Cake will make your mom smile. It is a delicious and authentic German cake. Happy Baking! - Pre-heat oven to 175 degrees C or 350 F.
- Grease the bottom of a baking form (round or heart shaped). - Separate eggs, beat the egg white until firm. - Mix egg yolks with 90 g sugar and the salt; beat until foamy using the double boiler method. - Carefully mix in the firm egg white. Mix baking powder with flour and powder it over the egg mix and mix it carefully. - Fill the dough into the form and bake it for 30 minutes. - Let the biscuit cake cool off for 5 minutes then take it out of the form and place it on a baking grid, let it cool off completely, then cut it horizontal in 2 halves. - Soak gelatin, defrost berries. - Make the berry cream: Mix 200 g of the berries with 60 g sugar; puree them with a stick mixer or press through a sieve. - Add creme fraiche and mix with a wooden spoon. - Press all water out of the gelatin and combine with the berries. - Beat heavy cream until firm. - Before the berry cream gets firm fold in the whipped cream, mix well. - Spread half of the cream on the lower heart piece. - Place second part on top and spread remaining cream over it. - Add remaining raspberries on top and keep an edge of 1 inch (2cm). - Make the cake glaze per instructions and pour it while hot over the berries. - Beat remaining heavy cream until firm and spread 2 third of it it around the outer edges of the cake where you would place the almond slices.edges. - Fill remaining cream into a frosting bag and squeeze little frames in the 2cm (1 inch) wide edge around the raspberries. - Decorate the edges with almond slices that can be toasted or not.